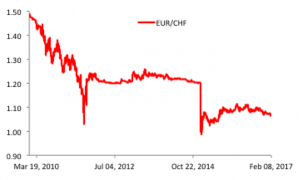 Price stability remains elusive. The Japanese economy is far from escaping its medium-term path of deflation. 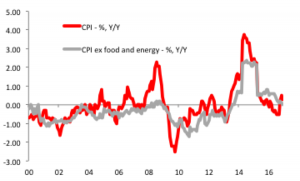 The Y/Y rise in the CPI was just 0.3% in December while core inflation was 0.1% and trending lower. (Chart 3.) The BOJ’s target of achieving 2% inflation “around” FY 2018 appears increasingly unrealistic, with the lingering adverse impact on economic growth of the April 2014 consumption tax hike acting to complicate further the path to price stability. For all of its many flaws, the current monetary framework for the BOJ therefore has the capacity to inject considerable additional stimulus into the economy as the pace of QQE accelerates. This can lay the foundation for a renewed weakening of the JPY. 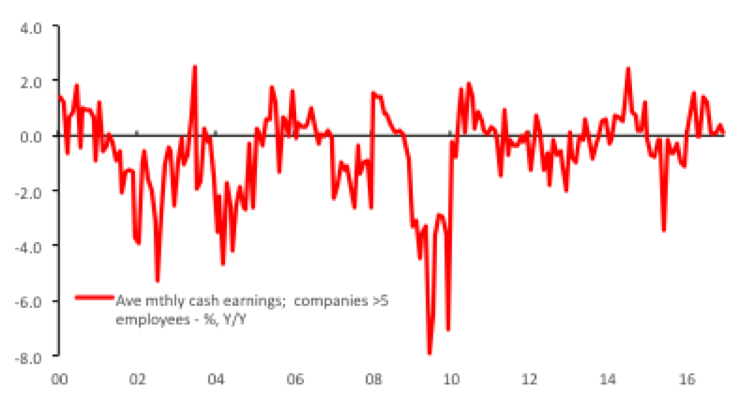 There is a complementarity at present between the need of the economy for more stimulus and defending a 10bp yield cap. Some central banks have a tradition of hawkishness (Buba). Others have a tradition of pragmatism (the Fed). Others have an unfortunately reputation for policy mis-steps and implementing inappropriate monetary policy decisions. The BOJ fits into the latter camp, and more recently the problem has been compounded by macro-policy errors with respect to fiscal policy. In short, Japan has rarely had a true coordination of policy across reflationary levers since the bursting of the bubble economy. Post-bubble to Abenomics. During the 1990s and 2000s the Japanese economy was supported by an expansion of the government spending and rise in public sector indebtedness. While the BOJ tried to match the government’s fiscal largesse with monetary easing, its efforts always fell short of a sufficiently aggressive and pro-active monetary reflation. This moderated the multiplier effect of the expanded fiscal spending. The problem was that the BOJ was guided by a flawed measure of the output gap, one that understated potential economic growth and thus the level of slack in the economy. 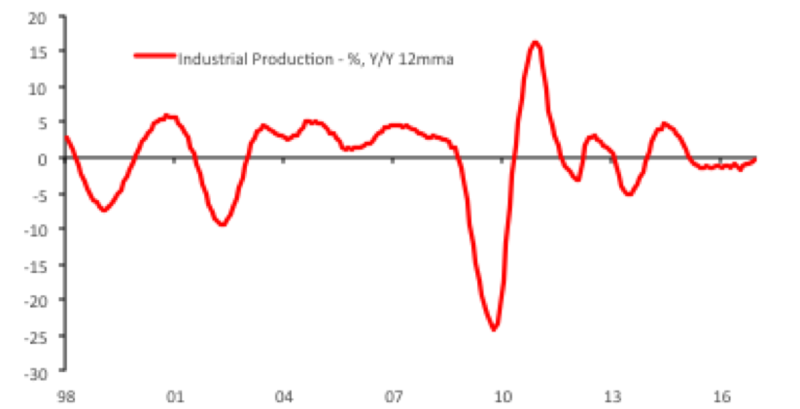 (For the geeks, the BOJ uses a Cobb-Douglas production function, which renders productivity growth as a residual. This creates a cyclicality whereby when Japanese growth slows, so does the measure of potential economic growth, which means that the BOJ tends to under-estimate the slack in the economy). This model has seen the BOJ ease too-little too-late and traditionally be prone to tightening too soon given that it frequently feared a rise of inflation that was purely in the mind, or more appropriately algorithm, of it’s flawed economic model. Over the past two decades, much gnashing of teeth and beating of desk with forehead from this analyst has accompanied BOJ policy decisions referencing a diminished “deflation gap” and “mounting inflation risks” based on reference to this flawed but nonetheless guiding econometric model. Abenomics Part 2. In 2015 and 2016, the BOJ was maintaining its aggressive monetary easing and targeting a JPY80trn annual expansion of the monetary base, but there was an opportunity to accelerate asset purchases further. The economy was struggling to recover the pace of growth seen prior to the consumption tax hike and inflation remained weak. Instead of accelerating monetary easing, last September the BOJ moved to its yield curve-targeting regime which – as noted above – creates a pro-cyclical policy framework which is simply not the correct way of continuing a multi-decade fight against deflation. 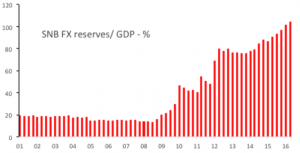 History does not provide a great deal of confidence that the BOJ will stick to its current monetary framework. Like the BOJ’s current need to defend it’s yield curve ceiling, there was a complementarity between the SNB’s policy framework and the immediate needs of the business cycle. Just as the desire to end deflation is consistent with the BOJ accelerating it’s rinban purchases, so did the lack of Swiss inflation support aggressive monetary expansion by the SNB. (Chart 9.) 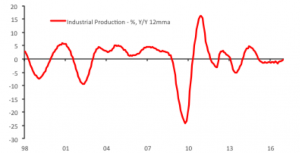 GDP growth was also subdued, and averaged 1.6% Y/Y during the period of the FX floor. From a practical stand-point, the SNB encountered far fewer technical impediments to maintaining a pronounced monetary easing than the BOJ currently encounters. While the BOJ is primarily purchasing JGBs which have a finite supply, SNB was selling CHFs which it was itself creating. 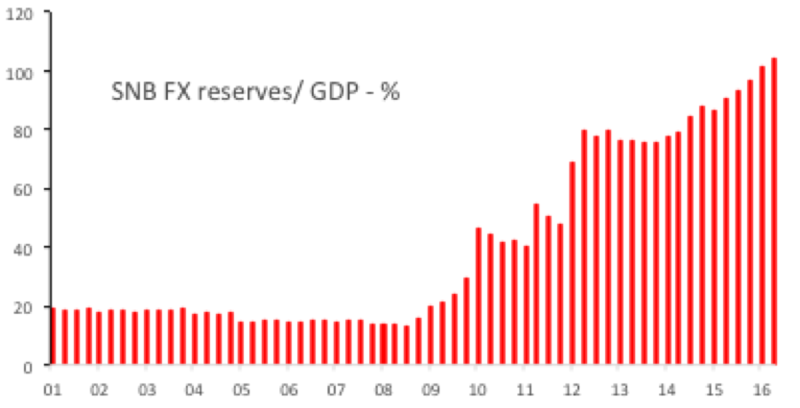 This enabled SNB’s FX reserves to surge from CHF337bn since the EUR/CHF floor was introduced to the present level of CHF646bn, and FX reserves now exceed the size of the Swiss GDP. (Chart 10.) Despite rising domestic concerns about a medium-term inflation risk stemming from such a pronounced monetary easing, both growth and inflation were stubbornly non-resistant to the expansion in the money supply. 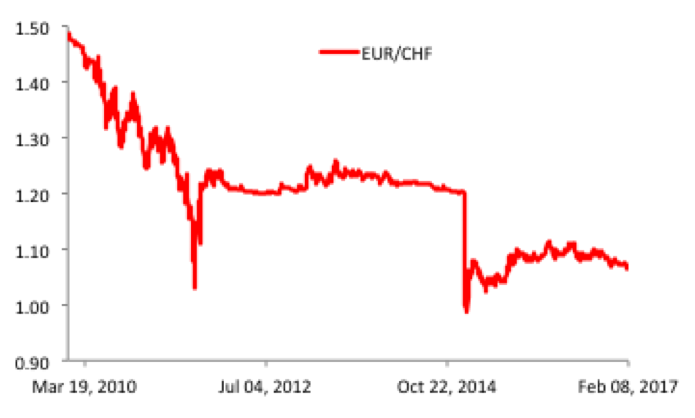 And yet, despite fewer practical restraints than the BOJ faces over the conduct of it’s monetary easing, the SNB chose to end it’s EUR/CHF floor on 15th February 2015. 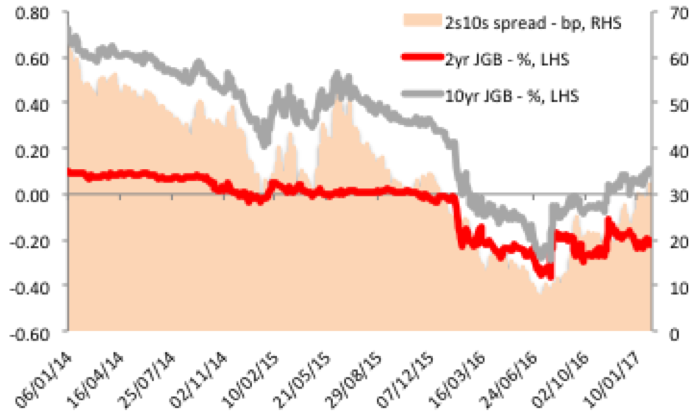 This adds an additional note of caution into the BOJ’s defence of it’s yield ceiling. Can we trust the BOJ’s fortitude? There are strong economic reasons to expect that the BOJ will maintain its yield curve targeting regime and attempt to make progress towards the goal of price stability and a self-sustaining phase of economic growth. 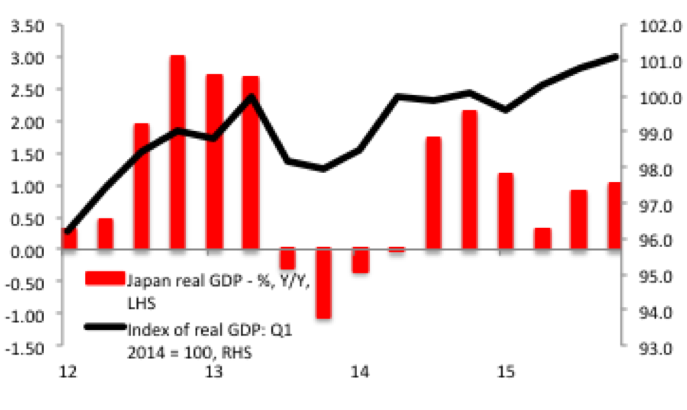 While Japan’s economy is experiencing an upswing in tandem with a global pick-up in growth, it remains weak and far from the level that will help secure price stability. (Chart 11). On a tactical basis, there is reason to be bullish JPY interest rate markets. 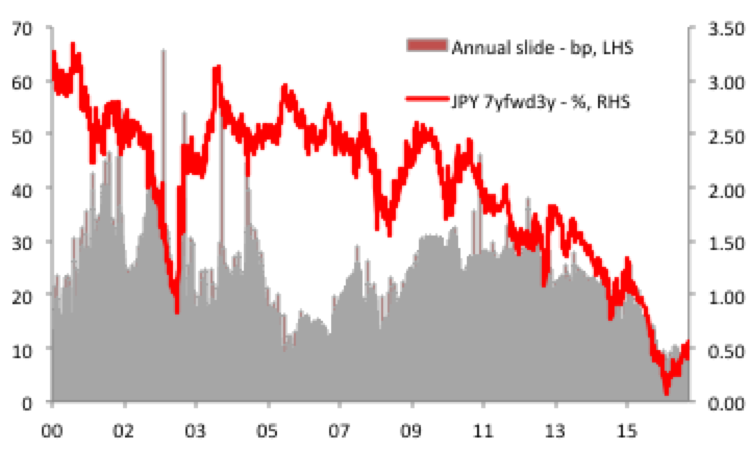 The JPY IRS 7fwd 3yr (the pivot point of the entire curve and our favoured way of expressing bullish views on the JPY interest rate market) currently yields 54bp and has an annual positive slide of 8.6bp. (Chart 12.) While this interest rate will struggle to reach the record yield lows of 5bp seen in July 2015 (which reflects how Trumponomics has subsequently pushed the pivot point for the 10-year part of the US yield curve 100bp higher (Trumponomics and the potential for a USD overshoot) and how the BOJ’s new policy framework would see such a rally presage fears of a premature policy taper) a move to 25bp is likely. 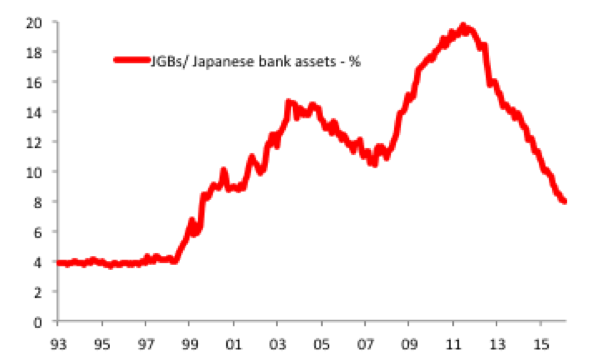 This is particularly the case given that the scale of the BOJ’s QQE is absorbing an ever larger pool of the “float” of JGBs and hence has the potential to have an increasingly convext impact on prices as the sellers of bonds to the BOJ grow increasingly reluctant to do so. However, despite this view, we struggle to recommend long-JGB/ received JPY IRS positions with any degree of conviction. This reflects how our instinctive bias is to seek trades with a positively convex return profile. Receiving JPY interets rates is a position with a potential negative convexity. While we do not expect the BOJ to break its yield curve targeting regime, a long history of Japanese policy mis-steps and the SNB’s experience of ending its FX peg when it had far greater technical capacity to continue than the BOJ has, naturally urges caution. 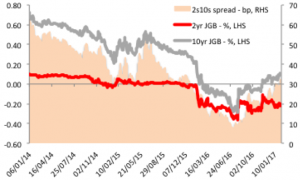 We do not expect the BOJ to break it’s policy framework over the rest of this year but were they to do so and allow yields to rise, the price action could be disruptive and illiquid as domestic investors moved to hedge/ pare-back their duration exposure: the JGB market has several experiences of sudden and sharp ~100bp sell-offs. Set beside this risk, 8.6bp of annual slide and a potential 25-30bp rally is not overly compelling. Of course, with policy rates at -10bp there is a limit to how far the curve could eventually sell-off and steepen as the carry and roll would become too enticing for domestic investors, but that does not preclude the potential for a severe initial over-shooting of yields. For choice we would therefore be long-JGBs/ received JPY IRS at the current level, but would view such positions as tactical and with relatively muted DV01 risk, given that a received position is potentially betting against an adverse policy shock. Similarly, a lesson of the SNB’s policy shift is that short-gamma positions can be particularly unappealing during periods when investors are effectively betting against the non-negligible risk of a regime shift in monetary policy. While it will take domestic investors some time to gain confidence that the BOJ is committed to capping JGB yields, the need for expanded rinban operations will – via an accelerated pace of liquidity creation – provide more immediate fuel for a weaker JPY. 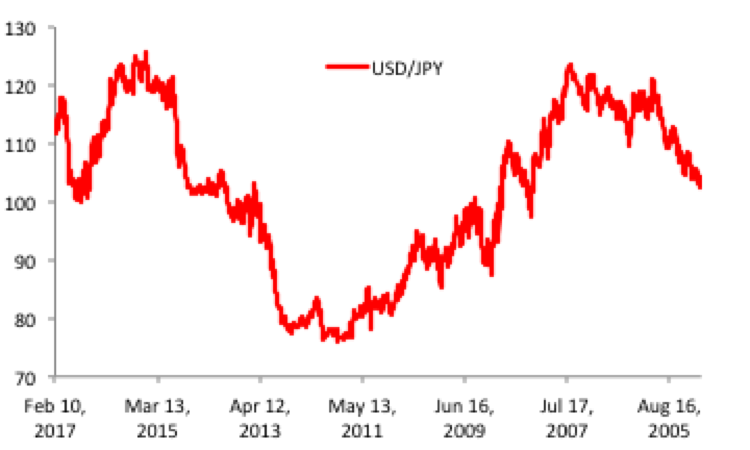 A higher USD/JPY would be expected to lead rather than be coincident to a possible rally in JGBs. 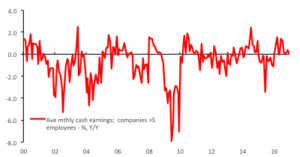 The current pick-up in the Japanese business cycle will lend support to USD demand: the JPY and USD/JPY in particular has been highly cyclical during recent decades whereby a stronger domestic economy and greater confidence among investors encourages an increased allocation to overseas assets. (As the old adage goes, “if you like Japan, sell its currency”). We therefore view weak-JPY positions as the better way to position for the pro-cyclcality of the BOJ’s policy framework. We believe the correction lower in USD/JPY since Trump’s election victory became manifest, is passing and recommend scaling into long positions. We expect a return to 120 wthin 3-6 months. This entry was posted in Downside Inflation Risks, Event Risks and Left Tail Events, Fiscal Policy Activism, Growth Crisis, Income Lite Recovery, Monetary Policy Expansiveness, Opportunities and Right Tail Events by Des Supple. Bookmark the permalink.